Dec. 26, 2012 - Pastor Yousef back in jail. Iranian media sources are reporting that Pastor Yousef Naderkhani, who was released in September after nearly two years in jail, was rearrested on Christmas Day by the authorities in Rasht. Pastor Yousef's attorney has also been jailed and has been in Evin Prison for the past three months. Dec. 20, 2012 - Pro-Tehran group seeks an end to sanctions. The National Iranian-American Council, NIAC, which has consistently lobbied the U.S. government to end sanctions and engage in direct negotiations with the Tehran regime, has sent a letter to President Obama signed by 24 U.S. and European "experts," arguing that sanctions will not compel the regime to halt its nuclear weapons program. NIAC's goal, once again, is to get U.S. sanctions lifted and to provide "cover" to the Obama administration for its efforts to craft a "grand bargain" that would guarantee U.S. recognition for the Islamist regime in exchange for window-dressing concessions by Tehran. According to Hassan Daioleslam, who won a landmark defamation suit against NIAC earlier this year (see our Sept 20, 2012 entry, below), this latest NIAC letter received a "warm reception in Tehran," where a group of former regime diplomats reported on the NIAC effort with the title, "Did the Iran Lobby Speak Out?" Dec. 19, 2012 – American Pastor Arrested, Held in Evin Prison. An Iranian-born American pastor, Saeed Abedini, has been arrested in Iran and is being held in Evin Prison on unknown charges. Abedini fled Iran with his Iranian-born wife in 2005 after threats of persecution because of his work with the underground “house” church movement in Iran. The State Department needs to instruct all US diplomats to name Pastor Saeed and other prisoners of conscience in Iran in ALL encounters with Iranian officials, and demand their release. This is what Reagan did – and it works. (Many thanks to Lisa Daftari for reporting this story at FoxNews and to the American Center for Law and Justice for representing Pastor Saeed and his American family. Dec. 17, 2012: Call to Action: Help Kick Khamenei off Facebook! 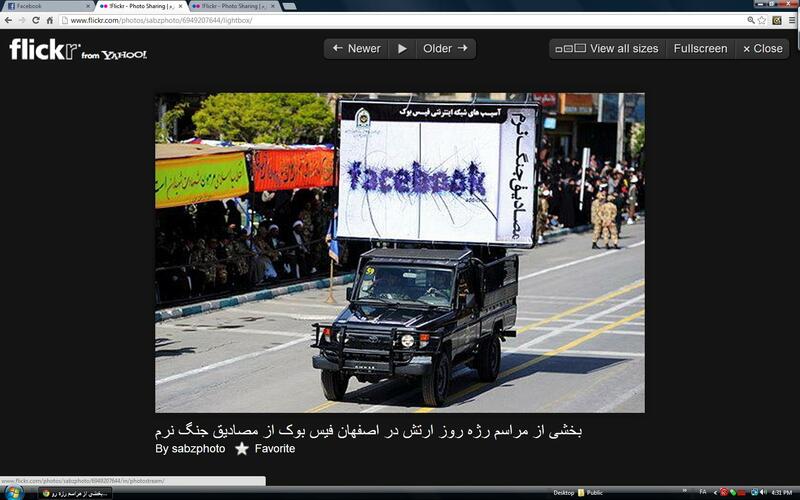 The “Supreme Leader” of the Islamic Republic today boasted about opening a Facebook page, the BBC reported. Many outraged Facebook users have already “liked” the page, hoping in that way to post negative comments. FDI urges supporters to take a different approach, and to use Facebook’s own reporting feature to demand that the page be taken down. We've posted the steps you can take right here. It's as simple as 1-2-3-4! Khamenei should not be given the courtesy of exploiting Facebook for cynical purposes when his regime mercilessly murders activists who use it as a vehicle of political expression. "Democracy is a two-way street," says former student leader Roozbeh Farahanipour, founder of Marzeporgohar. "They can't have it both ways." 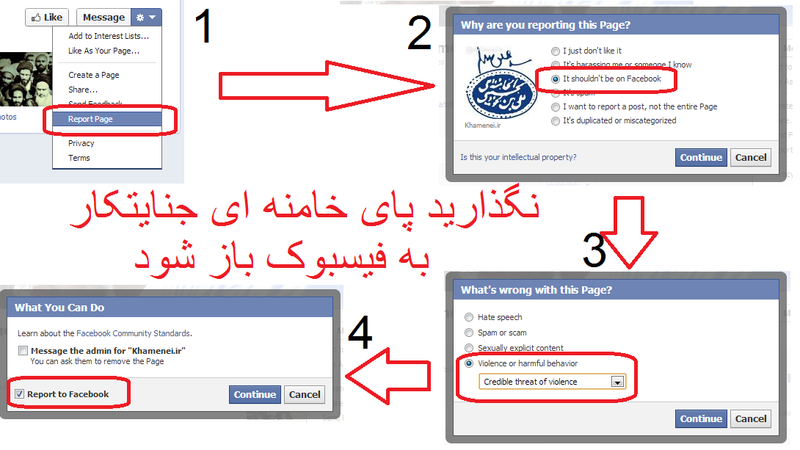 Please report the Khamenei page to Facebook NOW and demand that it be taken down. Not only is it offensive to all freedom-loving individuals, it is in clear violations of U.S. sanctions. Dec. 12, 2012: FDI’s Director of Strategic Information reveals Tehran’s latest terror plot. In collaboration with World Net Daily, FDI’s Director of Stategic Information, Reza Kahlili, today revealed the latest plot by the Islamic Republic of Iran to conduct terror attacks on U.S. soil. The plot involves highly-trained Iranian regime agents, most of whom are already in the U.S., who have recruited local assets and are being funded by an Iranian-American businessman who travels frequently to Tehran. All logistics are being handled directly by the commander of the Revolutionary Guards Qods Force, General Qassem Soulemani. Targets are being cleared with Supreme Leader Ayatollah Ali Khamenei. U.S. law enforcement and intelligence officials have been made aware of the plot and are working to thwart it. Dec. 7, 2012: A Worthy Debate. Loghman Ahmadi, the foreign affairs representative of the Kurdish Democatic Party of Iran (KDPI), describes the debate that took place at a recent leadership coalition meeting in Prague over the relationship between Iran’s minorities and the state. While FDI does not take a position on domestic Iranian political issues, we feel strongly that Iranians need to have these debates, and we will continue to use our good offices as honest broker to generate this type of honest and forthright discussion. From our many years of experience in these debates, however, one word of caution: little is to be gained by using “hot words” (such as “separatist”) to condemn the parties who feel passionately about these issues. Kurds, Azeris, Balouchis, Lurs, Bakhtiaris and others are just as Iranian as those Iranians who identify themselves as Persians. As part of its Strategic Information Project (SIP), FDI works with sources inside Iran, former intelligence officers, defectors and other sources to expose the secrets of the Iranian regime. The Strategic Information Project is led by Reza Kahlili, the pseudonym for a former CIA officer who worked under cover for more than a decade inside the Islamic Republic Revolutionary Guards Corps on behalf of the CIA. In partnership with WorldNetDaily, the premier investigative news site, FDI today disclosed a 2nd secret nuclear weapons-related site in Iran, following on the heels of earlier revelations of a facility used to develop the neutron initiator for a nuclear weapon. 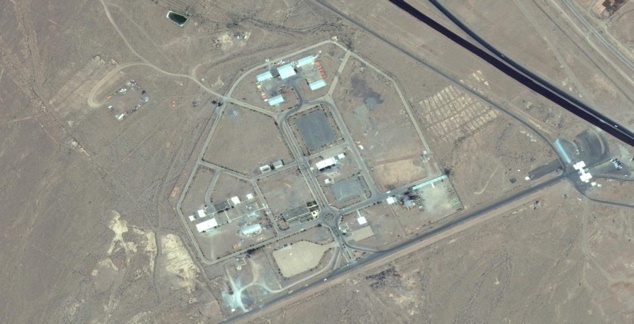 The new site, code-named “Fateh-1,” appears to include extensive underground laboratories hidden beneath above ground facilities, and is located outside the small city of Shahrokhabad in Kerman Province in southeastern Iran. The plant is engaged in transforming uranium ore into yellowcake. Kahlili hints at the possibility that the underground part of the facility could be a secret centrifuge enrichment plant. You can support FDI’s Stategic Information Projects and our other programs by making a tax deductible contribution. Email us for further information. FDI has consistently argued that only regime change can resolve the nuclear standoff between the West and the Islamic Republic of Iran. As the latest roundup of Christians shows (see below), the regime will cynically dangle sketchy “progress” on the nuclear issue in front of the United States, while arresting, torturing, and murdering its own people with impunity. FDI President Kenneth R. Timmerman, now a candidate for Congress, has issued a separate political statement on this latest development. Oct. 19, 2012: Hundreds of Christian House Church members rounded up. As the Iranian regime faces economic collapse because of its mismanagement of the nation’s vast economic and natural resources, it once again is attempting to find scapegoats for its failures. This week, it sent the secret police to found up hundreds of members of Christian house churches, apparently in an effort to intimidate former Muslims who have become Christians. Firouz Khandjani, a council member of the ‘Church of Iran’ house church movement, told reporters earlier this week that “ at least 100, but perhaps as many as 400 people, have been detained over the last 10 days” in Tehran and at least three other cities. "We know that many have been forced to say they will no longer attend church services in exchange for freedom,” he said. When Ahmadinejad first took office in 2005, he announced that one of his priorities would be to “crush” the house church movement in Iran. FDI calls on supporters of freedom in Iran to pray for imprisoned Christians and to lobby their governments to demand that the Iranian regime release these and other prisoners of conscience. Oct 18 – Pressure mounts against EU parliament trip to Tehran. Pressure mounted this week to cancel the five-member EU Parliamentary delegation planning to visit Tehran on Oct. 27. On Oct 17, Bnai B’rith called on the EU to cancel the trip, noting that “it would be counterproductive to the efforts being made to isolate Iran.” Also on Thursday, the EU Parliament’s Vice President, Alejo vidal-Quadras, called for the trip to be cancelled. “Such visits would give credit to the mullahs and is [sic] completely for the benefit of the Iranian regime to justify the repression, violation of human rights and export of fundamentalism and terrorism,” he said in Brussels. FDI has long advocated for keeping the MEK on the State Department’s list of international terrorist organizations because of its proven involvement in the murder of U.S. military officers and defense industry officials in Iran in the late 1970s. We also believe that the MEK operates as a cult, and that its brand of Islamic Marxism offers little real change from the Islamic Republic. That battle is now over. The State Department and the Obama administration have decided to impose a statute of limitations on murdering Americans overseas. This sets a very dangerous precedent and endangers all Americans, not just our diplomats and military. Delisting the MEK does not mean, however, that the group should get a free pass or that the FBI should abandon ongoing investigations into alleged money-laundering and racketeering charges against MEK members here in the United States. Going forward, FDI believes that the Treasury Department should also remove the Free Life Party of Iranian Kurdistan, PJAK, from its list of international terrorist organizations. Unlike the MEK, PJAK has never murdered Americans, has never advocated murdering Americans, and has strongly supported the United States. PJAK is a strongly secular group that stands as a bulwark against Islamist ideology. It also rejects separatism or any assault on Iran’s territorial integrity. In addition, FDI believes Congress should investigate groups such as the National Iranian American Council, NIAC, to determine whether it is operating as an unregistered foreign agent in its advocacy for pro-Tehran positions. Sept. 20, 2012: Judge vindicates Hassan Dai. The Free Beacon newspaper in Washington, DC wrote a detailed account of NIAC’s failed lawsuit against Iranian-American human rights activist Hassan Daioleslam. FDI president Kenneth R. Timmerman, now a candidate for Congress in Maryland, who is quoted in the article, pledged to conduct a Congressional investigation into NIAC’s alleged ties to the Iranian regime and for potential violations of the Foreign Agents Registration Act, FARA. Sept 14, 2012: The End of NIAC as we know it. A federal judge in Washington, DC on Thursday dismissed the long-standing NIAC lawsuit against Iranian-American activist Hassan Daioleslam, who has claimed in numerous news articles and opinion pieces that NIAC founder Trita Parsi acts as a “lobbyist” for the the Islamic Republic of Iran. You can download the judgment here. Judge Bates also ruled that NIAC was liable to pay Dai seventy percent of his expenses, which could amount to several million dollars. This will effectively bankrupt NIAC – unless, of course, his masters decide to foot the bill. Parsi has become the darling of the George Soros Left. Since President Obama took office, Parsi has been invited to the White House and to private dinners with Sec/State Hillary Clinton. It may be no coincidence that, as Mark Langfan argues in this compelling analysis, the Obama administration seems to have developed a tragic new concept of “red lines” when it comes to dealing with a nuclear-armed Iran: “Let's wait to attack Iran until Iran actually builds a nuclear bomb, and then we can't attack Iran because Iran has the nuclear bomb. “ Drawing on the unclassified annual “721 report” the CIA presents annually to Congress on the WMD capabilities of rogue states, Langfan argues that the overwhelming majority of Iran’s stockpile of enriched uranium was produced since 2009, “so Obama can't blame Iran's U235 enrichment on Bush. The 721 reports prove Iranian enrichment happened on Obama's "watch." Sept 2, 2012: Why NIAC and IRI apologists are mobilizing against Ken Timmerman. Please read this important post by FDI advisory board member, Dr. Arash Irandoost, regarding malicious, defamatory emails being circulating by NIAC sympathizers in Texas. Aug 30, 2012: FDI joins letter to Rep. Rohrabacher. FDI CEO Kenneth R. Timmerman has joined Iranian-Americans and other activists in a letter to Rep. Rohrabacher that sets out the history of Azeribaijan's ties to Iran. The letter ends with an exhortation to Mr. Rohrabacher to avoid the mistakes made by Obama, who ignored the cries of the Iranian people in June 2009 and turned a deaf ear to the murder of Neda. - Ban Ki Moon: UN supports freedom in Iran. After being roundly criticized for lending legitimacy to the regime by traveling to Tehran for the Non-Aligned Movement summit, UN Secretary General Ban Ki Moon gave a brilliant speech to Iranian academics calling for greater freedom and respect for human rights by the regime. We have our serious concerns on the human rights abuses and violations in this country," he told the group. Ban also warned the regime to loosen its stranglehold on political dissent. "Restricting freedom of expression and suppressing social activism will only set back development and plant the seeds of instability," he said. It is especially important for the voices of Iran’s people to be heard during next year’s presidential election. That is why I have urged the authorities during my visit this time to release opposition leaders, human rights defenders, journalists and social activists to create the conditions for free expression and open debate." Surely not the music the regime had been expecting! Aug. 29, 2012: Iranians join on-line petition against Rohrbacher letter. Rep. Dana Rohrabacher's July 26 letter to Sec/State Hillary Clinton (see below) has ignited a firestorm within the Iranian-American community. FDI invites our supporters to sign an on-line petition calling on Mr. Rohrabacher to retract his letter. "Any calls for separatism, such as the statement from Rep. Rohrabacher, are dangerous, ill-informed, and contrary to the expressed desires of the overwhelming majority of the people of Iran," said FDI founder and president Kenneth R. Timmerman, who has signed the petition. Aug. 27, 2012: Iranian defector blasts Fakhravar. Former Iranian intelligence officer Hamid Reza Zakeri released a second document purporting to be an MOIS letter granting a passport to self-styled "student" leader, Amir Abbas Fakhravar, for use in overseas operations. Zakeri explains his allegations on Mardom TV (starting at 1h:15min in the program. Aug. 24, 2012: No Political Prisoners? Iran has "no political prisoners," according to Mohammad Javad Larijani, secretary to the judiciary's so-called "human-rights committee." Read Washington Institute analyst Mehdi Khalaji's excellent Wall Street Journal oped about the "human rights opening" in Iran." Meanwhile, this week Supreme Leader freed 130 "political prisoners" from jail as part of an annual amnesty to coincide with the Eid el-Fitr celebrations. So which is it? Aug. 23, 2012: Women barred from science, industry. Nobel peace prize laureate Shirin Ebadi sent a letter to the United Nationsl today complaining that the regime has decided to bar women from studying dozens of subjects, including nuclear physics and materials engineering, both key for the oil industry. Also closed to women starting this year are computer science, civil engineering, English translation, and chemistry. "For the coming academic year, 36 universities have closed 77 academic fields to women," she said. Aug. 22, 2012: Christian pastor faces new charges. In their ongoing persecution of Christian pastor Youcef Naderkhani, the regime appears to have dropped apostasy charges, but now plans to try him for "banditry and extortion." This is yet another outrage from a regime that has vowed to "break" the effervescent house church movement inside Iran. Naderkhani's lawyer, who was disbarred by the regime earlier this year, will apparently be allowed to attend his trial in the coming days, although he was told international human rights groups that he is "not aware" of the new charges against his client. Aug. 18, 2012: Escalation from Tehran. On Friday, Ahmadinejad proclaimed Israel “an insult to all humanity” and “a tumor” that needs to be wiped out, during a speech marking “Jerusalem Day” in Tehran. Meanwhile, on Saturday Revolutionary Guards General Amir Ali Hajizadeh warned that any Israeli strike on Iran would provoke swift retaliation, allowing Tehran to "dump [Israel] into the dustbin of history." In comments broadcast by the regime’s English language network, Press TV, Gen. Hajizadeh threatened nuclear retaliation. “If the loud cries of the leaders of the Zionist regime are materialized, it would be the best opportunity for obliterating this fake regime from the face of the earth and dumping it into the dustbin of history,” Hajizadeh said. Aug. 16, 2012: MOIS Defector releases document on Fakhravar. A defector from the Islamic Republic’s Ministry of Intelligence, Hamid Reza Zakeri, has released a series of documents revealing alleged operational ties between a self-styled “student” leader, Amir Abbas Fakhravar, and MOIS. 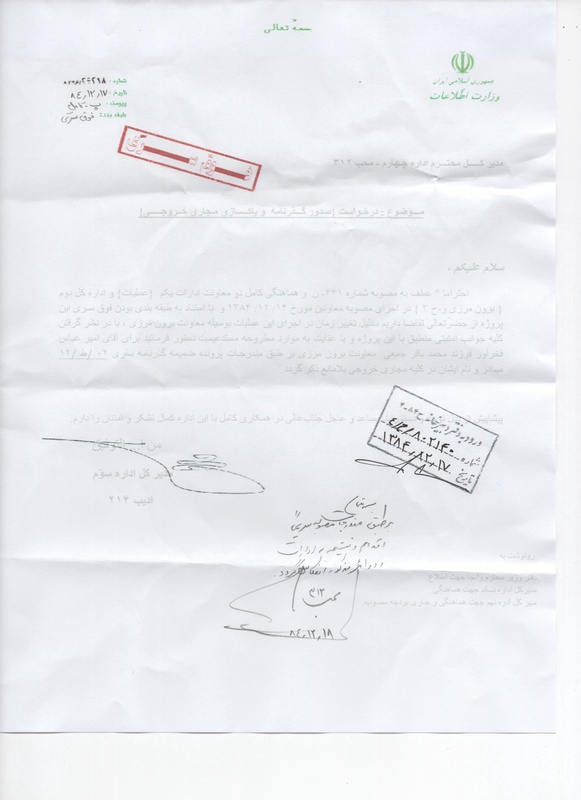 The third of five documents, released today, purports to be a letter from September 2004, signed by an MOIS official named Heshmatollah Mahdavi, giving instructions to a judge to release Fakhravar from prison, where the letter states he was serving time for illegally excavating and selling antiquities. 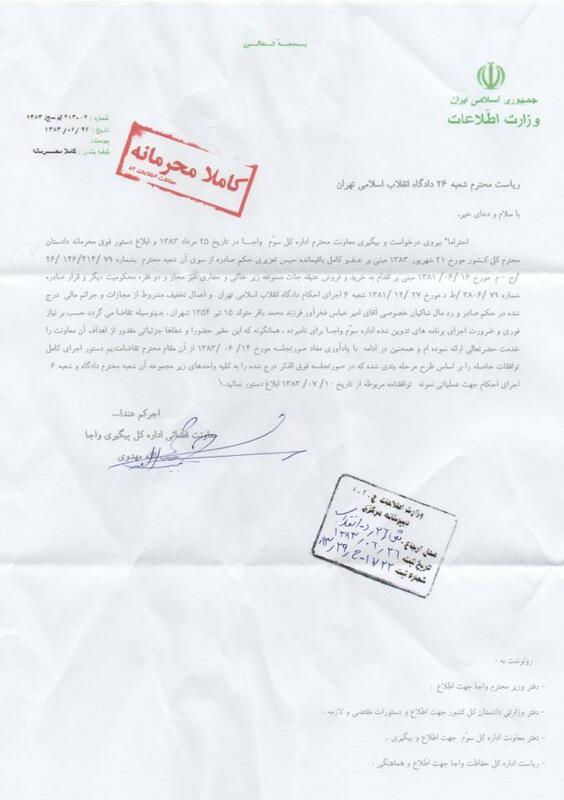 In the letter, stamped TOP SECRET, Mahdavi asks the court to waive the rest of Fakhravar’s prison sentence “in exchange for pending service to the ministry in a classified operation” that Mahdavi will describe to the chief of the Revolutionary court in person. Fakhravar has denied the authenticity of these documents, and FDI is not in a position without seeing the originals to determine their authenticity. Fakhravar is a divisive figure who burst on the scene in the United States in 2006, miraculously “escaping” from Iran on a fresh Iranian passport by flying to Dubai, where he was met by supporters who arranged for him to come to the United States. He has claimed to be a leader of the student uprising of 1999, although he has told FDI that he was then serving as a medic in a local police hospital where he helped treated student casualties, or (in another version) as a law student. Several people who later got to know Fakhravar when he was transferred from the criminal Qasr prison to the political wing in Evin prison have provided testimony shedding doubt on his claims to be a political dissident. Interviewed in different countries over a period of several years, they all pointed to his close ties to the prison warden, his ability to acquire street clothes, a cellphone, and other amenities forbidden political prisoners. Fakhravar's supporters have swept aside this testimony as rumor and hearsay from his political enemies and have provided an extensive account of his counter-claims. For additional background, see this Nov. 2011 article in the New English Review. Last September, a group of 102 former student activists and leaders wrote a confidential letter to the Library of Congress, claiming that the student organization Fakhravar claims to head is a fake. “The student confederation you refer to is a small group in [the] Washington, DC area that has no base among the Iranian students within the country or other locations in the world,” they wrote. Aug 15, 2012: NIAC lobbies candidates and incumbents. In a brazen lobbying email sent to Members of Congress and candidates, the National Iranian American Council (NIAC) and its left-wing allies offered an “off-the-record policy and messaging webinar” on Iran policy, featuring NIAC president Trita Parsi, to be conducted on Sept 12 at 2 PM Eastern time. NIAC and its associates have consistently sought to lobby Congress and the executive branch to remove sanctions on Iran and negotiate with the Iranian regime. During the 2008 election campaign, NIAC blasted the outgoing Bush administration for failing to “reach out” to Tehran, despite the fact that the U.S. held no fewer than 28 high-level negotiating sessions with Iranian regime officials from 2001-2008, to no avail. Aug. 13, 2012: War by Oct. 1? The next IAEA report is expected to detail new progress by the Iranian regime in uranium enrichment. According to Debkafile, the report will show that Iran will have 250 kilograms of 20-percent enriched uranium by October 1. This is enough to make a 1945-generation nuclear device – and enough for several more sophisticated weapons. Debkafile believes Israel will be compelled to launch military strikes on Iranian nuclear facilities after the U.S. national political conventions at the end of this month – and at the latest by October 1. July 26, 2012: Rep. Dana Rohrabacher calls for U.S. to back Azeri separatist movement. In a bizaare move, California Republican Dana Rohrabacher has written to Secretary of State Hillary Clinton, urging the United States to support the "reunification" of Iranian Azeris with Azerbaijan. This is precisely what the Soviet Union tried to do in 1947 when it backed a breakaway Azeri Republic in Iran - a move that led President Truman to threaten the use of nuclear weapons against the Soviets at the very start of the Cold War. "The people of Azerbaijan are geographically divided and many are calling for the reunification of their homeland after nearly two centuries of foreign rule," Rohrabacher wrote. "Aiding the legitimate aspirations of the Azeri people for independence is a worthy cause in and of itself," he added. FDI has consistently supported the rights of ethnic minorities in Iran in their quest for political freedom and human rights, and we have moderated a number of workshops and conferences where various forms of federalism or confederation within the confines of a united Iran were discussed. In his understandable desire to make life more difficult for the ruling Islamic Republic, however, Rep. Rohrabacher is openly advocating separatism, a stance that only plays into the hands of the Tehran regime. 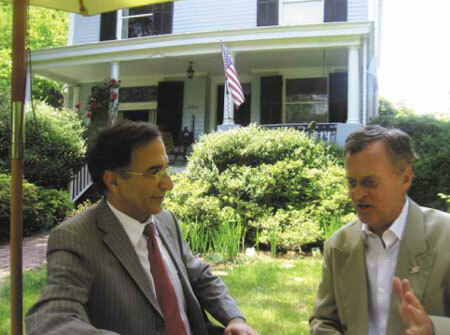 July 1, 2012: Former VOA reporter Jamshid Charlangi interviews FDI president Kenneth R. Timmerman. June 4, 2012: Iranian-Americans urge California legislature to adopt sanctions. In a letter to California state Senator Samuel Blankesless, a group of Iranian-Americans urged the adoption of S.R. 29, which would require the St.ate of California to impose tough new sanctions against the Islamic Republic of Iran. 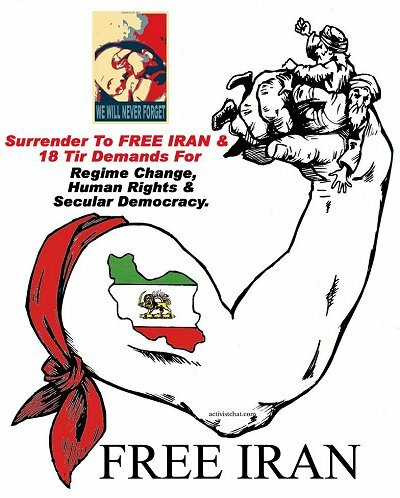 June 2, 2012: Iranian regime allows Nazi Propaganda website to go live. In a country where the state strictly controls Internet access, it is no accident when an outrageous Nazi propaganda website suddenly goes on line, praising Hitler for transforming Germany. Meanwhile, in the U.S., Code Pink and 1970s feminist Gloria Steinem shower the Tehran regime with praise. No surprise there. May 25, 2012: FDI CEO Kenneth Timmerman column on Iran negotiations. In a column with the Daily Caller, Timmerman warned of the dangers of phony negotiations with the Islamic Republic leadership over their nuclear program. In the lead-up to yet another round of negotiations with U.S. and Western government representatives in Baghdad, Timmerman warned that the regime's goal was to keep on "talking about talks, not about substance," all the while buying more time so the uranium enrichment centrifuges could keep spinning. May 5, 2012: Iranian-Americans protest appearance by pro-Tehran lobbyists Trita Parsi in Sweden. More than 1,400 Iranian-Americans signed a letter to the Swedish Foreign Ministry to protest their hosting an event with Parsi in Stockholm, one month after a U.S. court rejected NIAC defamation experts in their harrassment lawsuit against Hassan Dai. April 17, 2012: Iranian regime says it "will not tolerate" fall of Assad. Syria's Assad has been a staunch ally of the Tehran regime since the earliest days of the revolution, and Tehran is backing him to the hilt as he brutally suppresses protestors. Now the Islamic Republic claims to have established a "joint war room" with the Syrian leadership, while ordering Hezbollah into action to defend Assad. March 8, 2012: Ten minutes to midnight on the Iran War clock. FDI is happy to to take part in the Iran War Clock project of the Atlantic Monthly, even though it includes many "experts" we don't consider experts on Iran, as well as some people we normally wouldn't exchange greetings with. The conclusions are a mathematical averaging of our views, not a consensus. For example, FDI's view is that there is an 85% chance of war - why? Mainly because of the appeasement policies of Obama and the pro-mullah regime lobby, which is also represented on this panel, and their acolytes in Congress. Feb. 28, 2012: Your letters count. Regime appears to back down on Pastor Youcef death sentence. The international outcry against the death sentence handed down last week against pastor Youcef Nadarkhani for "apostasy" - that is, for becoming a Christian and refusing to recant his faith - appears to be having an impact. FoxNews reported yesterday that despite official statements from the regime that Pastor Youcef's was "immanent," as of Sunday he was still alive and in good spirits. FDI President and CEO Ken Timmerman will talk about what you can do to help Pastor Youcef tonight on the Michael Savage show at around 8:30 PM Eastern. The American Center for Law and Justice has set up a special website with activists' tools - twitter, facebook, on-line petitions - so you can add your voice to the outcry to set free this prisoner of faith. In addiiton, Representatives Trent Franks, Frank Wolf, Joe Pitts and Keit Ellison are sponsoring H.Res. 556 that condemns the Iranian regime for its ongoing oppression of religious minorities. Ahmadinejad pledge when he took office in 2005 to "break" the underground church in Iran, and has relentlessly persecuted house churches and Muslim converts to Christianity. On Monday, a court in Kermanshah, in Western Iran, condemned schoolteacher Masoud Delijani to three years in prison, solely because of his Christian faith. Arrests of Christians in Kermanshah has intensified following an edict from the intelligence services on November, calling on the police to monitor the activities of foreigners, Christians and other minorities. Feb. 19, 2012: Former Mossad operative: Thailand hit team fit Iranian government M.O. Apologists for the Iranian regime say Iran couldn't possilby have been behind the recent spate of anti-Israeli attacks around the world because of the amateur-ishness of the would-be bombers. But former Mossad operative Michael Ross says otherwise in this piece from Canada's National Post. Face of an alleged terrorist? 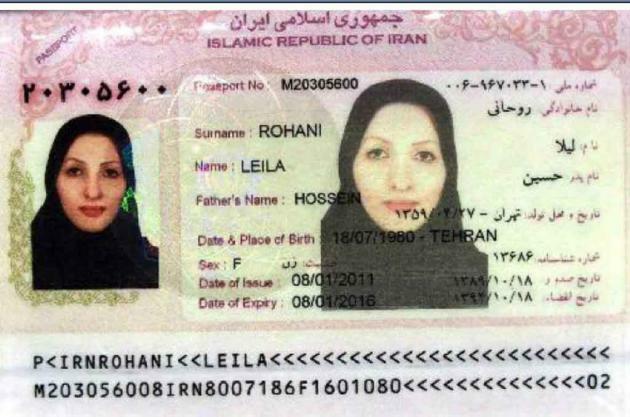 : One alleged member of the Bangkok hit squad escaped and fled back to Tehran, a woman named Leila Rohani. FDI sources have provided us with a copy of what purports to be her oficial passport. Feb. 17, 2012: Iranian regime bombers in Thailand. Authorities in Thailand yesterday released this photograph of three Iranian-born bomb suspects partying with local Thai women in Pattaya, during a stay in the resort town shortly before an aborted terror spree in Bankok. Israeli officials believe was the Bangkok hit team was part of a worldwide series of Iranian-government attacks on Israeli diplomats. Masoud Sedaghat Zadeh, left, was arrested in Malaysia, Mohammad Khazaei, center, was detained at Suvarnabhumi Airport, and Saied Moradi was lost a leg when a grenade he tossed at police bounced back at him. The day before their arrest, other terrorist cells believed to be tied to Tehran attacked Israeli embassy personnel and their families in India and Georgia. Feb. 12, 2012: Day of Infamy in Iran. For some two million Iranians who fled tyranny in their country and came to America to embrace our freedoms, February 12 will forever remain a day of infamy. FDI has been dedicated to helping the pro-freedom movement in Iran. Read executive director Kenneth R. Timmerman's commemoration of this day of infamy, and his message to the Iranian people. "We must finally understand that it’s not the behavior of the regime that poses a threat to world security; it’s the very existence of this regime," Timmerman writes. Feb. 11, 2012: Internet going down in Iran. How you can help. The Tor Project, a non-profit venture that provides anti-censorship proxy tools free of charge to users in countries such as Iran, just announced a crash effort to circumvent newly-erected cyber-walls around local ISPs, as the regime attempts to erect a CyberCurtain around Iran in the approach to next month's parliamentary elections. TOR is asking users with spare computer capacity in the West to set up "obfuscated bridge" servers. "This kind of help is not for the technically faint of heart but it's absolutely needed for people in Iran, right now. It's likely that more than ~50,000 - ~60,000 Tor users may drop offline," Tor Project's Jacob Appelbaum said. Technical instructions are here, and more complete information is available at Tor-talk. CNET is reporting that Internet-savvy users in Iran also are circumventing the blackout using VPN - virtual private networks - in addition to TOR and similar tools, CNET is reporting. Jan. 16, 2012: Iranian-American researcher murdered in Houston - the intel wars begin? According to initial police reports, someone walked up to Gelareh Bagherzadeh's car as she was about to park by her parents home in Houston, and shot her three times in the head through the window. They excluded robbery as a motive, since the assassin made no attempt to steal her purse, which was sitting on the front seat. Gelareh had been photographed taking part in anti-regime demonstrations organized by Sabz Iran, a pro-green movement group in Texas, but so far the FBI has not opened an investigation - just as they have never opened an investigation into the alleged "suicide" of Ahmed Rezai, son of former Rev. Guards commander Gen. Mohsen Rezai, in Dubai on Nov. 12. Jan. 13, 2012: "War or regime change," financial analyst says. In a refreshingly clear-headed exchange on Bloomberg television, financial analyst and author James Rickards examined recent talks between U.S. Treasury Secretary Timothy Geitner and the Chinese authorities and said they were all aimed at warning the Chinese that U.S. sanctions would be imposed on Chinese companies if they continued trading with Iran, and reassuring China that it would get the oil it needs to drive its economy. "It's about making sure they get replacement oil," Rickards said. War with Iran "began two years ago," he said. "2010 was the year of cyber warfare. 2011 was the year of special operations," with the assassination of Iranian nuclear scientists and sabotage of facilities. "2012, it's a full scale financial war." How Iran responds to the mounting pressures against it will determine the outcome. "Either there's going to be a regime change in Iran, or the Iranians will steer away from their nuclear program, or there's going to be a shooting war in Iran. It will be one of those three options." Rickards didn't hold out much hope that Iran would back off its nuclear ambitions, and at the end of the program shortened his short list: The "divide and conquer game has been going on for three years. It's over... It's going to be war or regime change." Jan. 4, 2012: Grover Norquist, Mullah's Ally. Anti-tax campaigner Grover Norquist has used the resources of his Americans for Tax Reform (ATR) organization to help hard-left and pro -Tehran groups lobby against U.S. sanctions on Iran, a new report reveals. 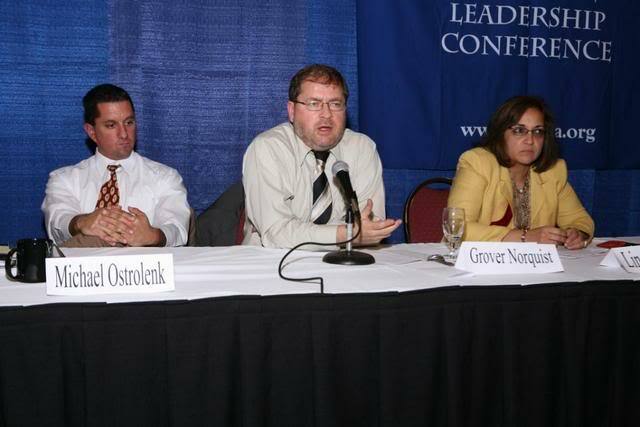 Norquist ally, Michael Ostrolenk (see photo), offered the ATR office suite to host a meeting to establish an anti-sanctions lobbying coalition in November 2007 that was spearheaded by Trita Parsi and his National Iranian-American Council (NIAC). Ostrolenk's group, the American Conservative Defense Alliance (ACDA) was "a founder and leader" of the anti-sanctions effort, known as Campaign for a New American Policy for Iran (CNAPI), the report states. Norquist appears to have understood he was skating on thin ice, and never publicly signed on to CNAPI's pro-Tehran lobbying campaign, even though he allowed them to use the ATR office for organizational meetings. As Parsi himself pointed out in an email to other members of the anti-Bush administration alliance, Norquist was a big get. "He exemplifies not just a powerful voice in the Republican Party, but also an important figure that can provide transpartisan legitimacy to our efforts," Parsi wrote. CNAPI's efforts against U.S. sanctions on Iran were supported in part by George Soros through his Open Society Institute, which paid the salary of a CNAPI staffer. The coalition included the hard-left Institute for Policy Studies; the Council on American Islamic Relations (CAIR), J Street, and the Campaign Against Sanctions and Military Intervention in Iran (CASMII) . "The founder of NIAC, Trita Parsi is an unpopular figure within the Iranian-American community, as can be seen from his high disapproval ratings in a July 2011 poll of over 1800 Iranian Americans taken by the Pro-Democracy Movement of Iran," writes Iranian-American activist Manda Zand Ervin. "If Mr. Norquist is supporting these apparently unabashed lobbyists out of a humanitarian concern for the people of Iran, he should know that a large majority of Iranian people have no problem with economic sanctions if they result in the removal of this illegitimate, dictatorial regime," she added. • Iran again asks Germany to expel German citizen...! During a meeting with German parliamentarians in Tehran on Wednesday, the head of the Iranian majles Human rights commnission asked Germany to expel PJAK leader Abdulrahman Haj Ahmadi, on allegations of terrorism, Fars News agency reported. Zohreh Elahian demanded that extradite Ahmadi to Iran, neglecting to mention that he has been a German citizen for decades. The Iranian regime has repeatedly demanded that the EU arrest and deport Ahmadi, and at one point managed to get Interpol to issue a Red notice for his arrest, as we reported last year. This latest Iranian demand comes less than one week after PJAK forces kileld 8 IRGC members and local Kurdish militiamen working for the IRGC during a clash near the Iranian Kurdish city of Baneh on Dec. 28. In its version of events, PJAK claims the regime is trying to violate the 5-month old ceasefire in Kurdistan and pin the blame on PJAK. If the regime continues these attacks, "we will use the right of self defence and respond to them as we did in July last year," a PJAK spokesman in Europe told FDI. Jan. 3, 2012: Tabarzadi's Video from Prison. A former student leader who has been in and out of jail for years managed to send an unusual 15-minute cellphone video message to the outside world and get it posted on YouTube. Heshmatollah Tabarzadi apparently filmed the message from Rajayishahr prison, where he predicted that the regime's attempts to silence dissent would fail. "I believe freedom is the essence of being human," he said. "Without freedom, choice has no meaning." The Tabarazadi video and an earlier one of prominent political prisoners taken inside Gohardasht prison are "example[s] of social media providing Iranian activists a platform on which they can express themselves more freely than through other, frequently heavily censored media," Radio Free Europe/Radio Liberty commented.